Check-in time is 15:00 and check-out time is 11:00. Room will be reserved until 18:00 of thecheck-in day without deposit.BunkBed in mixed dormitory room will be arranged by hotel. If you have any special request, pleaseinform hotel in advance for facilitate the procedure. Thetime applied here will be Taiwan Standard Time of GMT+08:00used in Taiwan. Ifcancelled up to 14 days before date of arrival, 100% deposit will be refund. Ifcancelled up to 13-10 days before date of arrival, 70% deposit will be refund. Ifcancelled up to 9-7 days before date of arrival, 50% deposit will be refund. Ifcancelled up to 6-4 days before date of arrival, 40% deposit will be refund. Ifcancelled up to 3-2 days before date of arrival, 30% deposit will be refund. Ifcancelled up to 1 day before date of arrival, 20% deposit will be refund. Ifcancelled or no show on the arrival date, 100% of the deposit will be charged. On the arrival date if hotel location or guest’s departure influenced by natural disaster, for example: traffic disruption or Typhoon warning by Central Weather Bureau and need to cancel the reservation, the prepaid deposit will be reserved for 3 months or can be refund based on deducting actual costs. If what you're looking for is a conveniently located hostel in Hualien, look no further than Hualien Wow Hostel. 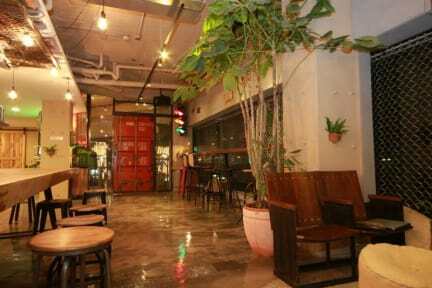 Well-positioned in the downtown area, Hualien Wow Hostel is an ideal departure venue of the trip in the adorable city. It is only 2-minute walking distance away from Hualien Train Station, where public transportation can be easily reached. There are plenty of tourist attractions in Hualien such as Taroko and Chishingtan, making a variety of activities available from morning to night. Meanwhile, the urban area has more than 6,000 shops, including clothing stores, restaurants, cafes, beverage stores and bookstores. 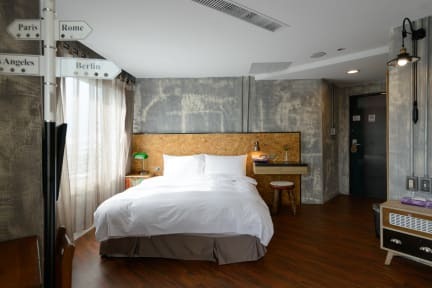 Renovated from an old hotel, Hualien Wow now is a fresh and lively hostel, bringing Taiwan endemic culture and natural environment characteristics to backpackers all around the world. Make yourself at home in one of the air-conditioned rooms featuring reading light. Guests can relax in the common room; complete with comfy sofa or catch up with friends or family over the internet. Free Wi-Fi access is also available throught the whole hostel. It's way beyond my expectation for a hostel. (less than) 5 minutes walk from the Hualien station. Comfortable bed. Spacious common area. Fantastic hostel. Felt like staying in a nice hotel more than a hostel! Staff were super nice, room was amazingly clean, location is great. The coin laundry is reasonably priced. The only thing is that the free breakfast was a little disappointing, it's literally just toast, coffee, and tomatoes. But for the price, I can't really complain about it. Probably one of my favorite stays at a hostel overall. The staff was super amazing with helping me with sorting out any traveling problems and gave me good recommendations on getting around and making sure I could go see the national park. My only problem is that I wish I stayed a bit longer. Best hostel in Taiwan. Awesome location, services, and rooms! Nice facilities, fine staff, location great for train station, not great for night market/Zhongshan Rd but cabs are easily accessible and relatively cheap. Very high quality hostel, built almost like a hotel. A bit large compared to a lot of hostels, but this didn't make it lack for personal connection and enjoyable hanging out. It's really well placed right opposite the main train and bus stations so easy to explore everywhere around Hualien. Special mention for the staff. They were all so professional, friendly and helpful. I arrived filthy and drenched after a tough bad weather cycle and they helped me getting my stuff and bike nicely sorted. Nice place, great beds and air conditioning throughout the day. Very well designed hostel ! Free breakfast is a + Bit dead in winter, almost more staff than guests around. The lockers have large holes in place of handles, so you can stick your hand in and feel around inside. And the bed was ROCK HARD. At first I actually thought I didn't have a mattress at all! Also, the cafe said it should open at 8am but on both days I was there it wasn't open until past 9? Seems like most people just go to taroko gorge for a day then go on their way, so it wasn't very social, but the staff make an effort to organize group activities. This was the worst place I stayed in Taiwan. The pictures of the dorm rooms are misleading. Two couples were in the room sharing beds. Beds are actually connected to each other. I booked this hostel even though it was more expensive because the pictures show blackout curtains. the curtains have huge gaps as do the partitians. People use their lights which shone right into my bunk. Too much money spent on decoration and not enough thought into comfort.